A frugal spender seeks to find new ways to save money and increase her net worth. 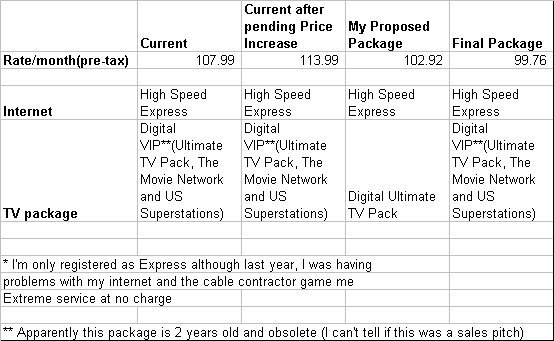 As I mentioned in my last post, I had to make an attempt to reduce my cable bill. I was facing another price increase to an already hefty bill. After looking at various packages on Rogers website I finally mustered the strength to pick up the phone. I had decided to cancel The Movie Network package and downgrade to the Ultimate TV pak. While my package was already a Digital VIP package where prices are not broadcasted on the website, I figured this was going to save me about $15/month. - After 5 minutes of being on hold, the customer service rep, offered me reduced overall rates of 10%, waiving the modem fee, waiving the digital terminal fee, waiving the system access and the final price was $93.76. After this a price increase of $6 would still apply as these rates are apparently going up across the board. Below is a summary of my ending package. I managed to save $8.23/month by keeping the exact same package. After the price increase, I'm technically saving $14.23/month. I have to call back in February 2007 if I want an extension to the reduced rate. While I was at it I asked for an evaluation of my cell phone plan as well. I couldn't get much out of them. I'm already on one of the lowest rate plans and get a 10% discount because of my bundle package. I cancelled my Essential Value pack leaving me only with voicemail. This was a saving of $5/month. I've been tempted for awhile now to sign up for a personal video recorder for $9.99/month. But... that's not going to help me save any more money so I'll resist the urge until the technology becomes more affordable. If Rogers won't reduce your bill, check out Look.ca. They were having financial problems awhile ago but I think they've rebounded. Unfortunately, as an apartment dweller, Look or satellite isn't an option. I have a question. Are the prices that they quoted you with taxes in? I am trying to get a better deal with Rogers myself and am using your deal as a benchmark. I reduced my Shaw (highspeed + full cable) by $5 also today :) ... I purchased the modem for $29.95. So now I'm paying $79 and change / month. Also, they gave me extreme high speed free for a month ... it's pretty fast and I'm happy. However, I don't think that it's worth the extra $10 / month unless one runs servers / downloads tons of movies. Thanks for the heads up frugal canadian and keep up the good work. I like reading your Blog.